It’s getting hot out there, so these are the perfect summer snack. Plus, you can just quickly make them and store them in the freezer, then they’re ready when you are! For these, you’ll need some Nestle Gerber Yogurt Blends and Gerber 2nd Foods Baby Food from Walmart (we’re sharing another AMAZING recipe later this week – doughnuts! – using Gerber Oatmeal Cereals, so grab those while you’re there, too). Why would I use baby food and cereal in my recipes, you may ask? They’re all-natural without added sugars, making them a much healthier choice than what I could grab at the store. Plus, being this simple to make and having control over what goes into my kids’ food is a definite bonus! Now I did two different recipes, but you can mix it up based on the flavors you have or want. My kids were split between which was the favorite – the Peach Lemonade or the Mixed Fruit! Carefully pour (or use a funnel) into your popsicle molds. See – super easy! 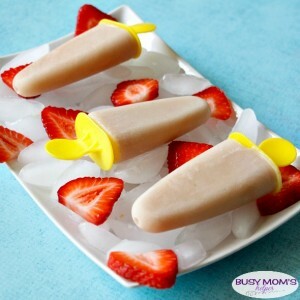 You could even let your kids get in on the fun and let them try mixing different flavor varieties to make their own popsicle recipe. Don’t forget to grab some Gerber Cereal while you’re at Walmart for our delicious doughnut recipes coming later this week! There’s four varieties: Gerber Oatmeal Single-Grain Cereal, Lil’ Bits Oatmeal Banana Strawberry, Oatmeal Banana Cereal or Multigrain Cereal.